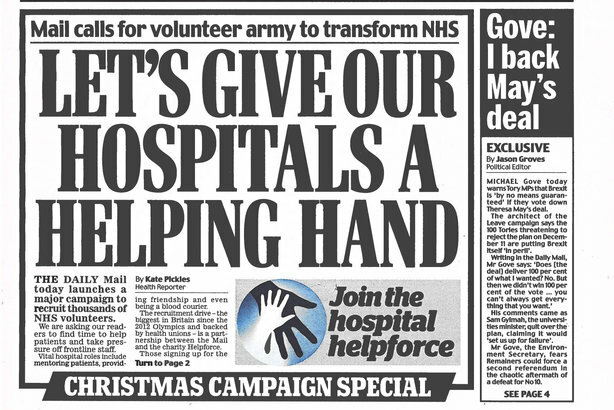 The Helpforce volunteering charity has recruited 33,000 people to give their time to the NHS for free, as a result of being chosen as the charity supported by the Daily Mail's 2018 Christmas campaign. 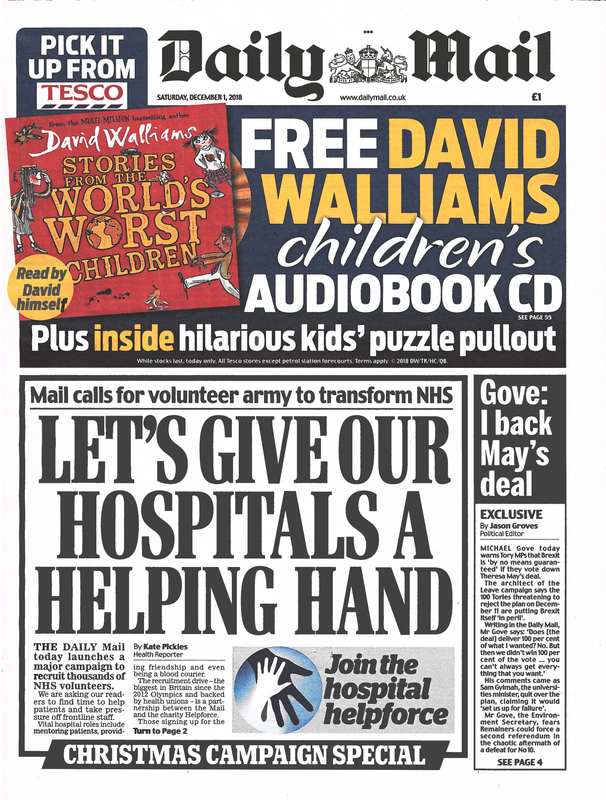 The partnership came about after the charity, with the help of Forster Communications, approached the Daily Mail with the idea of a campaign to raise the profile of volunteering, and grow the number of volunteers helping the NHS. 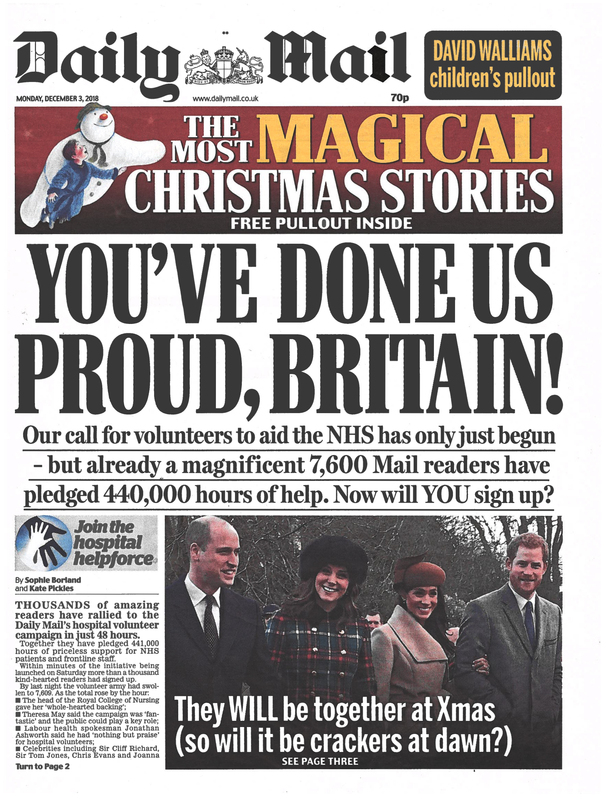 The campaign was launched with a front page article in which the newspaper appealed to its readers to become NHS volunteers. Readers were asked to commit at least three hours a week, or one day a month, for six months. Key messages were highlighting the benefits of volunteering, which can not only help patients and NHS staff, but be fun, rewarding, and often life-enhancing for the volunteers themselves. Case studies drawn from the 78,000 volunteers who already help in the NHS were used to communicate the benefits of volunteering. Several individual stories were featured in films used to promote the campaign. Although the primary target audience was the Daily Mail readership – in print and online – the campaign reached the wider British public through broadcast media coverage. Promoted on social media with the hashtag #bethehelpforce, the campaign was endorsed by high-profile celebrities such as JK Rowling and Piers Morgan. Brilliant campaign in today's Daily Mail. Join forces with @help_force to support our wonderful NHS with volunteers. Other prominent supporters of the campaign included Prime Minister Theresa May and Simon Stevens, chief executive of NHS England. And the Prince of Wales hailed the campaign as "an incredible example of British spirit that will make a real difference to so many people’s lives in the months and years to come". The results surpassed expectations, which had been to recruit 10,000 new volunteers. The month-long campaign resulted in 33,064 people pledging to give a total of 1,861,200 hours of support to the NHS. Volunteers are now being matched to local NHS trusts to be trained and undergo necessary checks, with the aim that they will start in the Spring. Harry Day, project director at Forster Communications, said: "We’ve been involved with Helpforce since its early days because we saw it could be game-changer for the NHS." He added: "I’m really proud we have played a key role in getting it from an idea 18 months ago to a living, breathing campaign that has inspired thousands of people to sign up to volunteer for the NHS. The opportunity to shape initiatives like this don’t come along often, but they’re the reason why Forster exists."